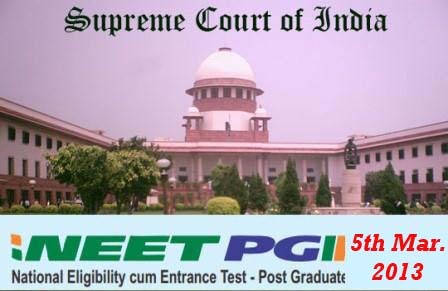 NEET PG Case 5th March 2013 Updates: Case will continue on 6th March - AcrossPG Exams! Today, the case discussion started with Mr. R Venkatamani (On behalf of Pondicherry), which was proceeded by arguments from Mr.K. K. Venugopal, on behalf of linguistic minorities and some colleges in karnataka. The case will continue on 6th March 2013.